This is an extremely appealing disc, with works of high interest and impeccable playing. The oboe has long been one of my very favorite instruments and I shall say flat out that I already love this recording. 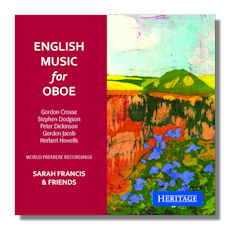 Sara Francis is billed as the leading British oboist and I would not dispute that. Her playing is full-toned, beautifully phrased, and expressive, with appropriate tempos. The accompanying players are all highly accomplished and happen to be some of Francis' closest colleagues, as she reports. The musical selections here, all except for the Howells, were composed for her. The notes, by Sarah Francis, with quotes from some of the composers, are filled with biographical information and enough formal description to give clear conceptions of the structures of the various works. Thus I shall follow my usual practice of attempting to communicate what the works sound like from a listener's perspective, which is just as well, as I must confess I have had difficulty hearing adequately the structure of some of them; this is not meant in any way as criticism of the works. I will say that sound of the oboe dominates all of the works except for the Herbert Howells (1892-1983). Gordon Crosse's (b. 1937) own description of his piece, based on an orchestral piece of the same name, reveals that it "works away from" the opening theme toward the second theme heard at the end, with the oboe initially having material from the first theme while the cello "prefigures the second theme." In between are eight variations with the two instruments sharing material from both themes. What mostly engaged my ears and attention was the fascinating variety of timbres, pitch-extremes (including a few seemingly off-pitch passages), textures, attacks and phrasing exhibited by both instruments. These included some fluttering, chirping, pizzicato and short melodic phrases. Some of the sounds produced by the cello, from resonant, to hollow-sounding, whispering, and gravelly, were quite strange and intensely interesting; I would like to have seen them being produced, at close range. Stephen Dodgson's (1924-2013) Quartet is in three movements: Andante, Allegro vivace, and Allegretto. The final movement is slightly longer than the first two together. Melodic treatment is more flowing than in the Crosse, notably in the Andante, and the trio's contribution is in counterpoint with the oboe, though the piercing sound of the oboe tends to dominate the strings, except when the latter are briefly heard without the oboe. In the Allegro vivace, where the oboe trills at the outset, the strings play together, and briefly alone, with some pizzicato and some scurrying rather than flowing motion. The Allegretto is opened by the oboe; the strings follow with legato phrasing and delicately light dynamics. The forces alternate and sometimes offer a complex mix, with a variety of effects. The violin and then the cello stand out briefly. Toward the end of the movement the oboe has a long melody over the strings; there is shimmering sound from the strings and the lower voices have some strong phrases. There is a unison ending. Peter Dickinson's (b. 1934) Four Duos (marked Moderate, Lively and precise, Slowly, with foreboding, and Bright, well articulated) are all brief, and three of them, in "homage to Charles Ives" use a twelve-tone row from that composer's 1905 Three-Page Sonata (a fact I find astonishing in view of the date). What I hear is a strong opening by the cello, followed by the oboe. There is upward motion by each instrument, with a pause following some pizzicato. The oboe plays quietly, then chirps, trills and chirps again. The cello has some strongly accented and heavy things to say, but adds some light pizzicato and, if I hear it right, strikes the cello with the bow. The oboe plays in a high register and begins the next piece with a long note and a trill, accompanied by a strong attack by the cello. The oboe is lively and chirpy and has a notable repeated phrase of a long note followed by two brief ones. The third duo, I confess I hear as hesitant rather than foreboding. The cello plays softly and seems to wander a bit downward at one point. There are brief pauses, but also some stronger assertions. The final Duo is indeed well-articulated, clear throughout and the two instruments are more equally paired than in most of the other works on the disc. The cello pays with a much fuller sound than in other works. Herbert Howells Sonata, at twenty and one-half minutes, is the longest work on the disc. Coming after accompaniment only by strings – if anything – It is in four continuous and unmarked – but described – sections: Placido, teneramente, ma con moto; Lento assai espressive e tranquillo; Allegro mosso [agitated], scherzando; Epilogue: Tranquillo, mesto [sad], ma con moto. The opening is flowing; the Lento is quite beautiful, with long notes for the oboe. The Scherzo exhibits a shift in manner and has a marked modulation halfway. The final note in the piece is a satisfyingly quiet piano tone. This recording has my strongest recommendation. Copyright © 2015 by R. James Tobin.